In this dramatic Funniest of Awl cartoon, Peace Democrats are depicted as thieves and rioters who murder and steal from free blacks in the North. The main figure in the center is a Catholic Irish-American. 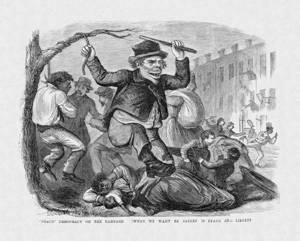 The scene is intentionally reminiscent of the violent draft riots in New York City in July 1863.